Since 2012 when post-bubble prices bottomed out, sale prices for both houses and condos have been trending upward. Home prices do not go up in a straight line but tend to trend in a certain direction while bouncing up and down within that trend depending on the time of year. All the more reason not to obsess over / over-analyze a single month's data. 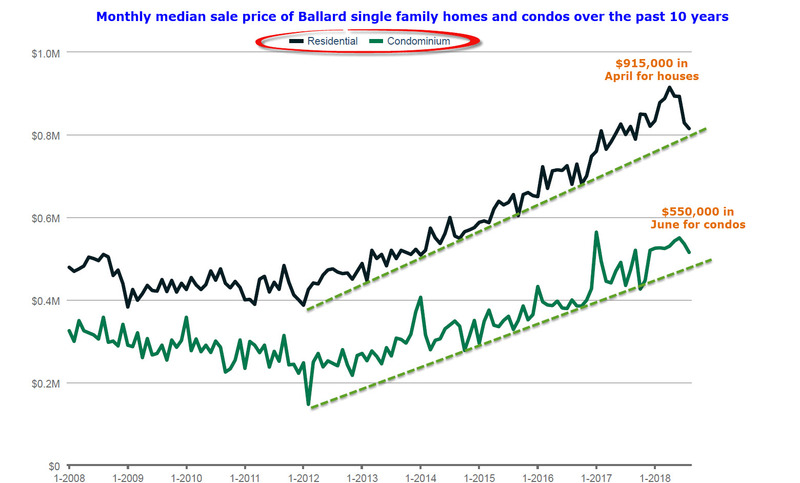 For the Ballard Seattle, median sale prices for both single-family homes and condos have been trending upward and bouncing off a lower level trend line. The longer-term trend has been upward, but the shorter term trend has been downward. House prices have dropped for the past 4 months since peaking in April. However, August median sale prices are still above the upward trend line. My prediction is that if prices drop below the trend line for 3 consecutive months, then the market will head downward for a longer period. 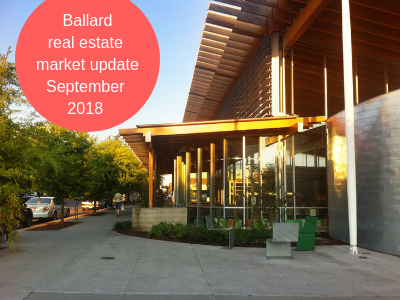 Next up, let's look at Ballard housing inventory. Housing inventory is measured in months. For example, 2 months of inventory means that if no new listings came on the market, there would be no homes for sale after 2 months. The plot below shows how the inventory of homes for sale in Ballard has varied over the past 5 years. Since 2013 the inventory had been trending downward as prices trended in the opposite direction. In the last few months, the supply of homes for sale has broken out of that downward trend and currently, we have the most homes for sale since 2014. This is not because there are a lot more new listings coming on the market. The recent increase is due to homes taking longer to sell and cumulating on the market. Definitely, good news if you are on the buyer side of the equation. 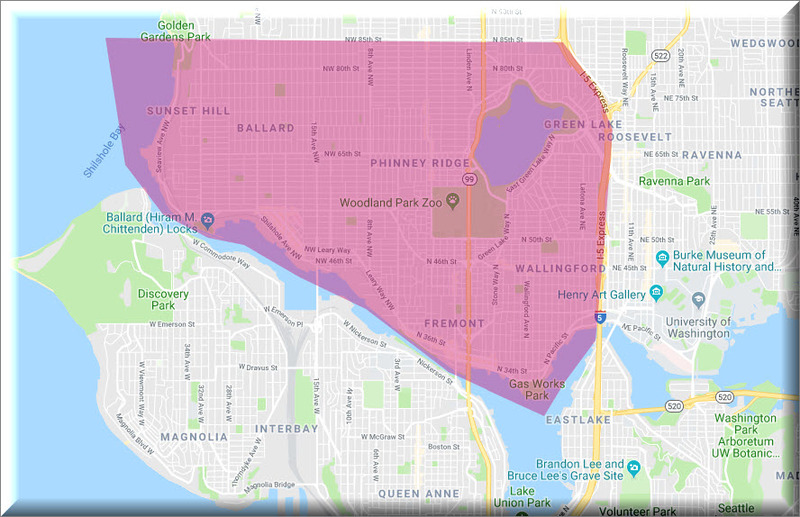 How much are Ballard homes selling for relative to the listing price? When the market was booming, most homes were selling quickly and many for well over asking price. 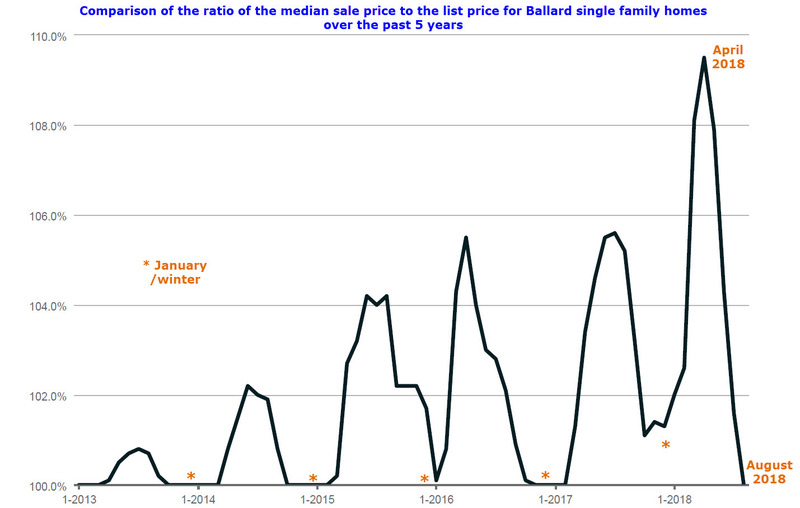 The graph below shows how the ratio (%) of the sale price to the list price has varied over the past 5 years for the Ballard Seattle real estate. Since 2013, homes were, on average, selling for more than list price during the peak spring and summer months and the ratio has been trending upward, hitting about 110% in this spring of this year. Over that same time period, during the winter months, homes sold for, on average, at list price. (100%). Interestingly, for August 2018, the ratio has already dropped to "winter levels", i.e. 100%. So what's the market going to do next? The quick answer is, nobody knows for sure. Foresight is a great thing. Regardless, we are at an interesting stage in the market. Previously, all the market signals indicated an upward market; increasing, falling inventor and homes selling for more and more above list price. 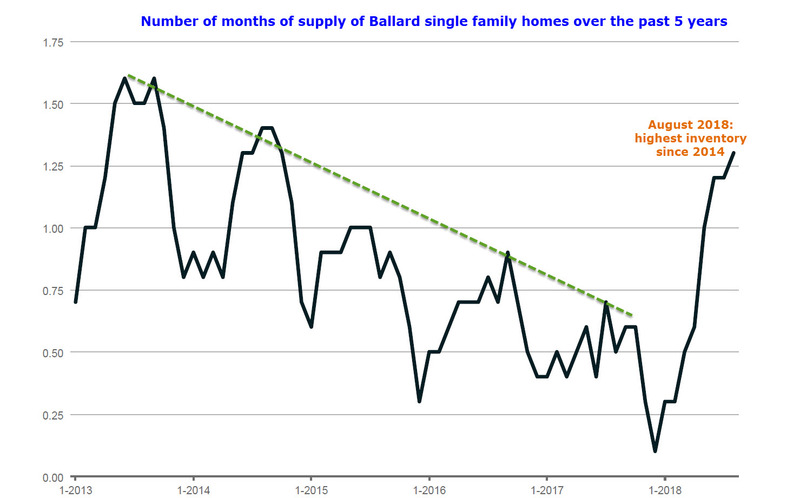 Currently, although Ballard home prices are still above the upward trend line, the last 4 months of price drops combined with the increased inventory of homes for sale, plus more homes selling for closer to list price, indicate that the market might be plateauing, softening or about to head downward. For home buyers, this is probably music to their ears after years of bidding wars and missing out of homes. For Ballard sellers, although the market might be softening, don't forget, that your home has accumulated a lot of equity over the past 6 years and have essentially doubled in value since 2012. We will need a few more months data to see if these trends will continue. Should be interesting to see what happens. The above article was written by Conor MacEvilly. Conor is a Realtor living in the Ballard neighborhood of Seattle. He works with both home buyers and sellers in the greater Seattle real estate market and on the Eastside in neighborhoods like Redmond, Bellevue, and Kirkland.